We do this every month now. Cus you guys like it. Why is it always special? Because there is always something new happening at MOVES. Like a live performance by RAFT. Educational opportunities. The most beautiful tank tops and leggings in the world. MOVES is proud to present an intimate performance this Sunday. Pat Noecker and guest Beth Red are RAFT. Long time RHLS ally and invigorating Brooklyn-based artist, Pat Noecker paints a beautiful landscape of sound with a touch of melancholy all in a tidy minimalist hand. Champagne as always, all day.. ESPECIALLY SPECIAL NOTATIONS! 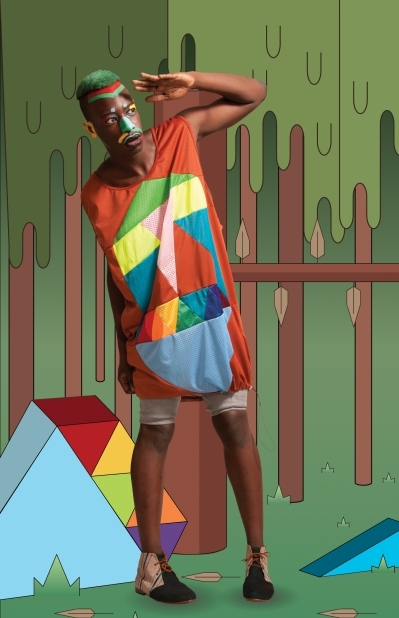 : We are really fffffffed up excited about our newest featured artist and featured designer. Moves now has available for you a very limited collection of works from Jon Burgerman. Enjoy new delicious Prints, Books, Mugs, Colouring Books and Colouring Wall Paper designed by the man himself. One word to describe the latest addition to Moves' accessories section: UNFUCKWITHABLE. Alexandra Rothwell is the intricate bead work dreams are made of. Seriously. Warning. Addicting. Sunday April 15th 2-9PM. RAFT at 4PM. 419 Graham Ave. Graham stop off L train. ALL PERTINENT INFORMATION HAS NOW BEEN STATED. READ ON FOR A SHORT MOMENT WITH RUFFEO. As Lil' Snotty and I plunge forward into yet another era within the movements that define us which are: local and accountable manufacturing, independent design, transparent business practices and supporting human rights in manufacturing facilities worldwide, we sometimes lose touch with our immediate community here in Brooklyn. With new friends joining the newsletter chain and old friends continuing to follow we've come up with a term to define/refine/discuss and support the above stated causes: Our working word for this movement is The "Ethic Aesthetic". I want to point out that anything we invent at MOVES or RHLS is created with intention. This goes for Ethic Aesthetics as well. Words like "eco-friendly" and "sustainable" are being used loosely by everyone from companies in the food industry to the fashion industry. We feel there is a deficit of intellectual property within the independent industry movement specifically within the local clothing movement. We would like to add to/create a set of standards and a vocabulary to progress ethically created clothing. We'd love to talk more about standards of manufacturing and responsible business practices this Sunday! After all Moves is short for Movement. HOW: SUNDAY APRIL 15TH 2PM-9PM. CHAMPAGNE ALL DAY AT MOVES CONCEPT STORE 419 GRAHAM AVE BROOKLYN NY 11211. RAFT AT 4PM.